Some think teaching is about conveying information. Some argue that it is about developing critical thinking. Others frame it is a means of fostering lifelong learning and a spirit of inquiry. Is there a best model? Teaching is about all of the above, but more importantly, it is about forging and maintaining relationships. It is what one might call the art and science of teaching. Every morning a teacher looks out into the classroom. A few students wait expectantly. Some are talking with friends. Many are likely checking their smartphone, updating their status on Facebook, or jotting off a quick text – one of 3,000 that month. Student conversation is as likely to be electronic and face-to-face with what Zachary Taylor calls the last backpack generation. 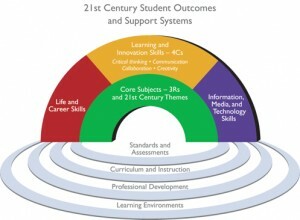 To answer that question, let’s look at two related frameworks for 21st century student competencies. The P21 framework complements and sometimes parallels the ISTE NETS Standards for Students. 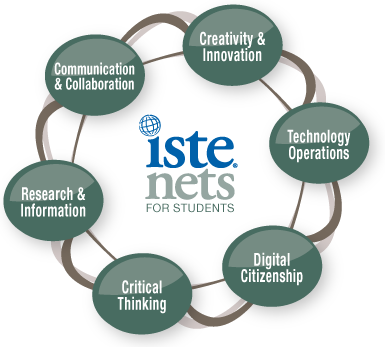 Now let’s look at the ISTE NETS Standards for Students. 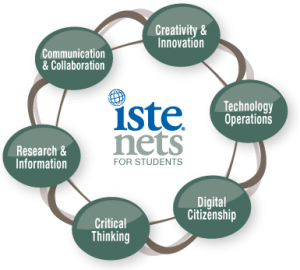 The National Educational Technology Standards are often called NETS. ISTE has created student as well as teacher and administrator standards. In this blog, I want to focus on communication and collaboration. ISTE joins them together as a single linked construct. What is the role C&C plays in education? How does one understand good teaching in the context of effective and caring relationships? Personal and social relationships are critical to the learning process. Working in cooperative groups improves learning outcomes. Verbal communication shifts between teacher initiated talk and student initiated talk. The roles of teachers and learners are complementary. Jerome Bruner, a cognitive psychologist, has been a widely known advocate of social construction of learning model. As the name implies, his is a constructivist model of learning in which the individuals build knowledge with the scaffolding of the social group. The focus is on experiential or environmental factors in learning. What Bruner showed was that is was not just peer pressure that affected performance of the individual in the classroom, but communication with peers affected how concepts developed. Nowadays one has to consider that the “group” of peers in which an individual students functions is not just those around him or her. It includes those with whom he or she is connected virtually in their social networks. Take away a smartphone from a teenager, and they may feel as if a vital appendage has been removed. My thesis is that teachers need to embrace social technology. It does not mean that you, the teacher, have to have students follow you on Twitter, but you need to understand how central it is to their reality and cognitive process. I have come to think of technology as a “language” with its own syntax and transformative grammar. These days teaching involves both understanding how cooperative groups work as well as how technology works in the learning and communication process. One of my favorite books is Alone Together: Why We Expect More from Technology and Less from Each Other by Sherry Turkle (2011). 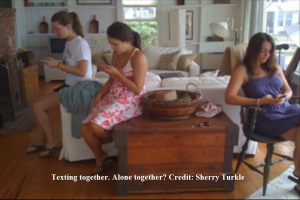 If you are more visual, then check out her TED video from 2012, Sherry Turkle: Connected, but alone? Technology does not just change what we do, it changes who we are. Vygotsky is the psychologist who popularized the concept called “zone of proximal development” or ZPD. The more common term “scaffolding” is often applied in classroom teaching and learning. The effective teachers scaffolds new concepts – makes them accessible – so that students can master them. Underlying this is the essential role of social learning in cognitive development. Stated another way, students construct meaning and develop competency more readily in social or cooperative learning groups. Those groups can be real-time, face-to-face or mediated in one of the social media venues. In other words, teaching requires cultivating relationships both with students and between students. Cooperative learning is an extremely important tool in the teacher’s toolbox. How one cultivates these relationships – especially in the context of cooperative learning and modern electronic media – will be the content of the next blog. Teaching is about relationships as much as mastery of knowledge and skills. Students will respond to those with whom they have a relationship more readily than one in which they feel no connection. There is art as well as science to teaching. In the mind of the teacher is the world of his or her students. The teacher can never forget to ask, “Do I know who you are?” Not knowing, one must begin questing for the answer. In the journey lies the answer. ♦ Is the world really flat?